The Freed React Men’s Latin Shoe is one of the best looking shoes in our Men’s Latin range at Duo Dance London. This is a stylish, contemporary shoe in Black Leather and Patent with a 1.5″ Cuban heel. The Freed React is a lace-up shoe with a split sole for maximum flexibility. It has a padded insole to increase comfort and secure fit. The shoe is available in a regular and WIDE fit. The Freed React is a perfect shoe for both the Professional and social dancer and suitable for Competitions and Medal Examinations. The React Men’s Latin Shoe is a standard round toed shoe with a split sole for maximum flexibility. The smooth Black Leather features a Black Patent design at the side of each shoe and a double stitch at the front. It is a traditional lace-up shoe but the stunning design adds extra glamour and sophistication. The Freed React is available in UK sizes 4 -12, including half sizes, has a 1.5″ Cuban heel. 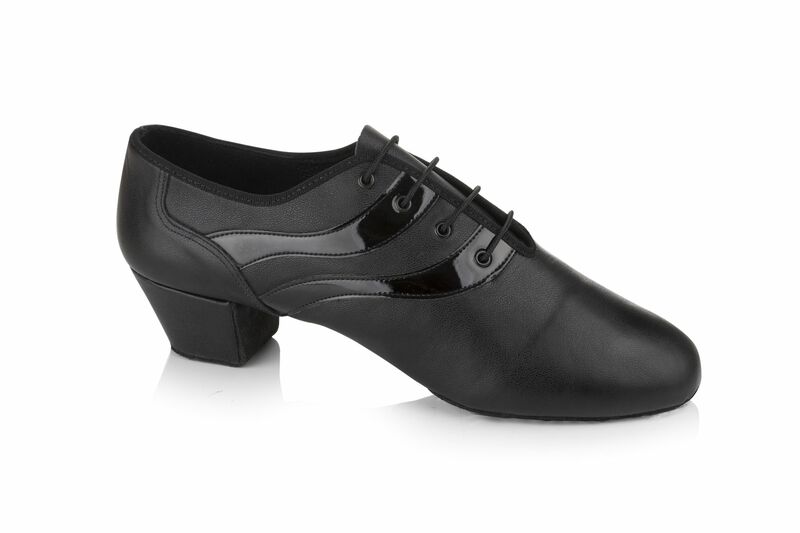 Split sole to allow the dancer maximum flexibility. Padded insole to increase comfort and enhanced support. Shoe brush with cover (in Accessories) to keep your soles free from grease and dirt. Freed of London Shoe Bag. It is sometimes possible to change the heel, width, choice of fabric as a “made to order” option. Please email us at info@duodance.co.uk. “Made to Order” options take up to 8 weeks to manufacture but well worth the wait to have a unique shoe. Freed of London will charge a nominal charge for this service.